Last week I showed you the special Ohlone basket recently brought into the Oakland Museum's collection. As part of the ceremony and celebration, a group of Pomo Indians performed sacred dances prior to the basket's presentation. Linked to ABC Wednesday. Captured on a fabric wall surrounding Peralta Junction, a temporary art installation and community event in West Oakland. Community developers and local artists have created a magical area on a previously empty lot where games, movies, and special events will occur until mid-December. I recognize the artist's style but can't tell you his name. Addendum: I think this is by Cannon Dill. If you like murals or have a mural you'd like to post, this meme's for you. Just follow the Linky steps below. You decide what constitutes a mural. Be sure to link back to this blog and visit your fellow posters. Looking forward to the mural finds posted this week. The annual Piedmont Avenue Halloween Parade is the Saturday before Halloween. 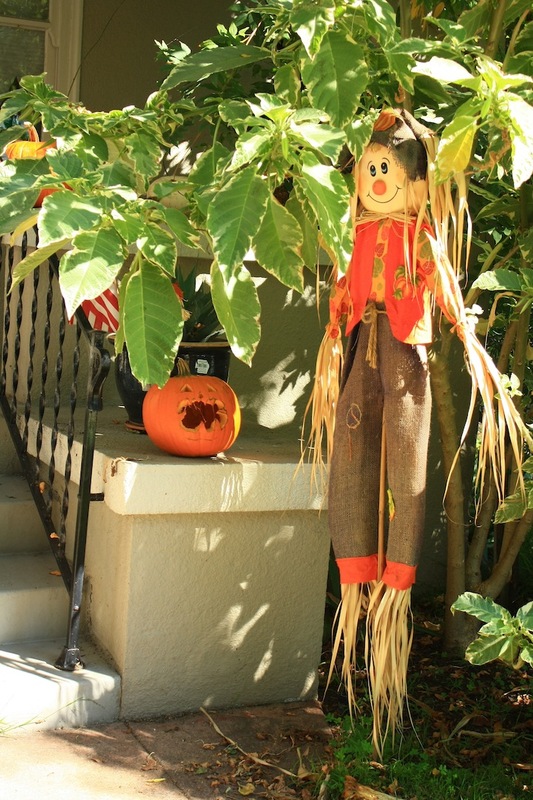 Adults have as much fun (or more) as the kids dressing up and walking about. 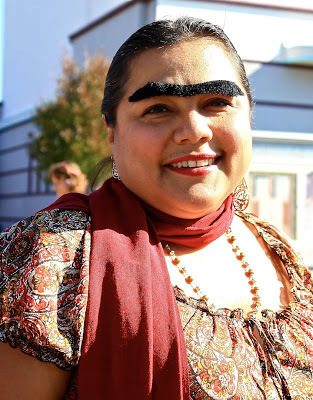 Last year Frida Kahlo was seen on the Avenue more than once. I guess the unibrow was a popular look. 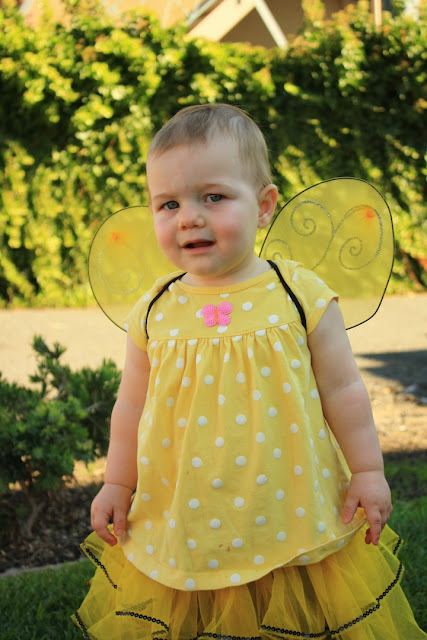 This year it was all about fairies. This little guy was a whiz on his scooter. 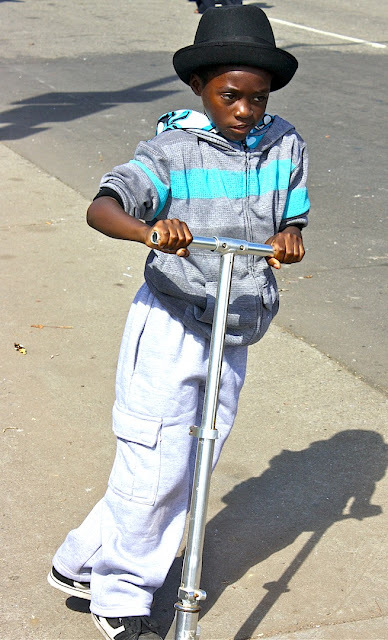 He easily rode around the crowd without causing problems or irritation. His fedora added a dashing touch of style to his appearance. 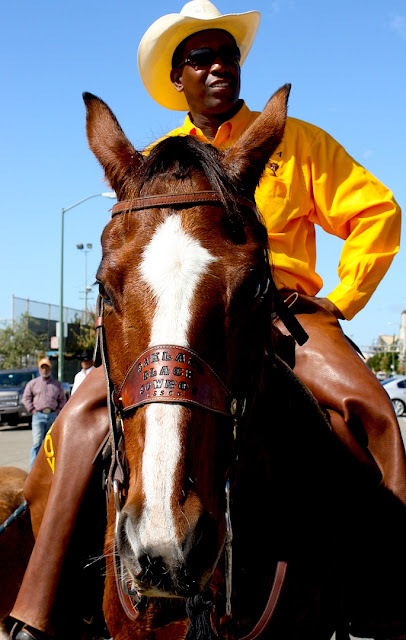 Spotted at the Black Cowboy Parade in West Oakland. The Ohlone Indians lived along the shoreline of the San Francisco Bay for thousands of years before Europeans came to the area. Ohlone baskets are extremely rare, in part due to the tribal practice of burning personal possession upon death. The Oakland Museum commissioned Linda Yamane, a Rumsien Ohlone of the Monterey area, to make a basket for the museum's vast collection. Featuring 20,000 stitches, several thousand feathers, and 1,200 handcrafted Olivella shell beads, the extremely rare basket took Yamane nearly three years to create. It is believed that it has been 250 years since this type of ceremonial basket has been made. Linked to ABC Wednesday. More California history found at Mt. View Cemetery. Linked to Taphophile Tragics. Throughout much of Oakland, utility boxes are canvases for local artists. This one is located in the Uptown area and was captured during an Art Murmur event. 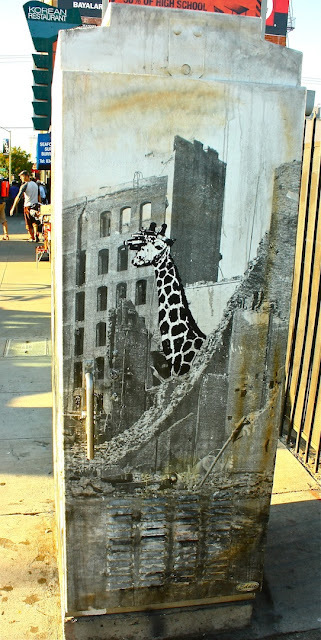 It looks like the giraffe wandered into a Godzilla movie. Lots of detail and layering in this piece. If you like murals or have a mural you'd like to post, this meme's for you. Just follow the Linky steps below. You decide what constitutes a mural. Be sure to link back to this blog and visit your fellow posters. Looking forward to the mural finds posted this week. Sorry about the delay. It was due to a posting error. After a few days of rain, we're back to fair weather. 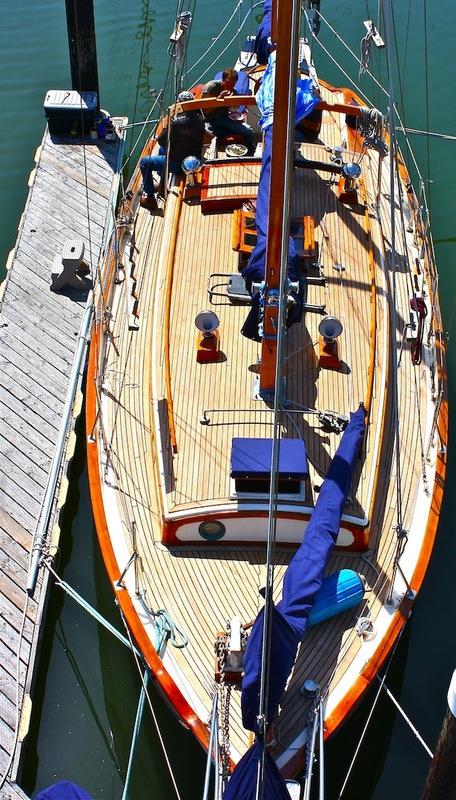 Still time to take the boat out on the bay while it's sunny. Weather probably doesn't matter much to true sailors, in the same way it does to landlubbers like me. Spotted at Embarcadero Cove. Linked to ABC Wednesday. The Peralta Hacienda Historic Park is the last remaining parcel related to a vast land grant that once included most of the East Bay. As part of their education program is a series of murals showing the annual cycle of life on the rancho. They were painted by Maren Vanduyn and installed in 2007. She collaborated with the Friends of Peralta Hacienda Historical Park’s executive director and Ohlone culture bearer Linda Yamane to conceive the murals. While there are too many to present here, this close-up gives you a feeling of the detail included in the mural sequence. "Ecstasy" was constructed by Karen Cusolito and Dan Das Mann in 2007 and used that year at Burning Man. It stands 30 feet high and weighs 9 tons. 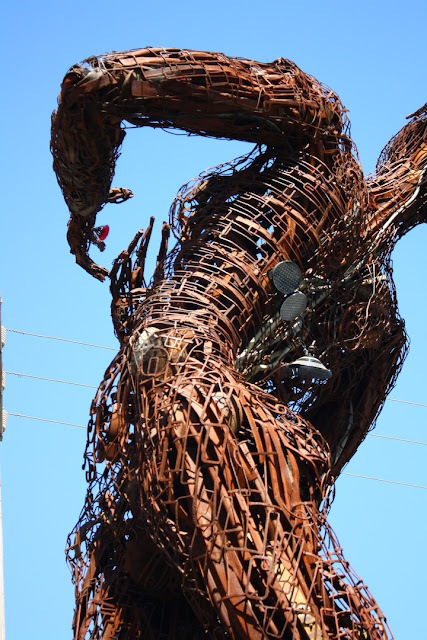 In 2010 the sculpture was installed for several months in a park in San Francisco's Hayes Valley neighborhood. She now resides at the entrance of American Steel Studios in West Oakland where Cusolito has her work space and also rents studio and gallery space to over 100 artists and small businesses. 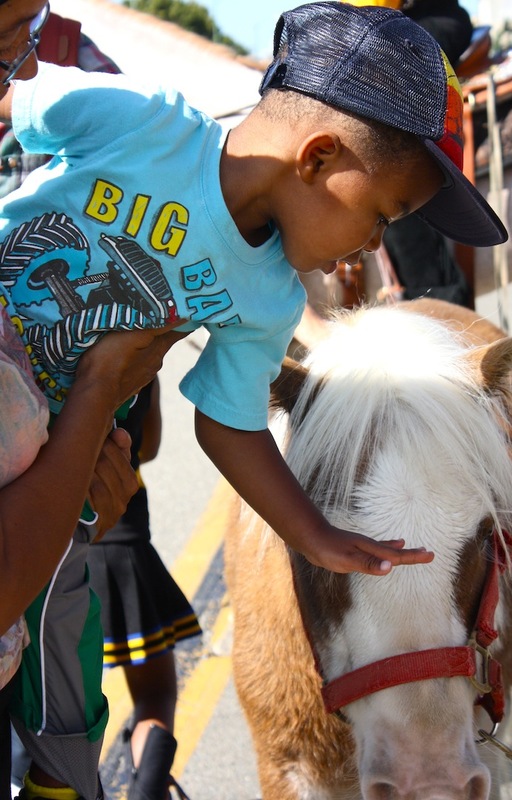 Saturday was the 38th annual parade organized by the Oakland Black Cowboy Association (OBCA). The homespun parade was held at DeFremery Park in West Oakland and included high school ROTC drill teams, Girl Scouts, the Red Hat ladies, a book club, local politicians, and church groups. 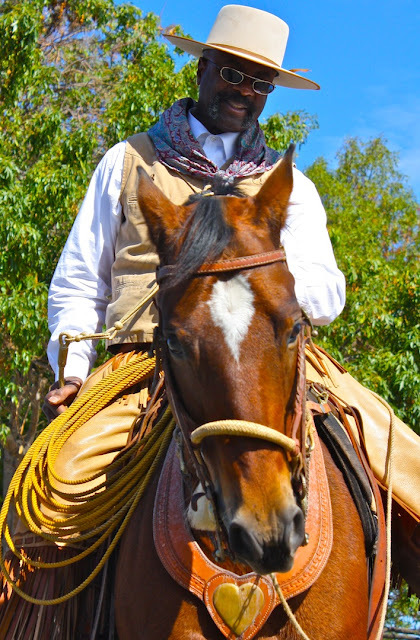 The highlight was, of course, the cowboys and guest charros from Lincoln, CA. The parade was smaller than in past years due to the organization's dwindling membership, but the crowd was enthusiastic and there was literal dancing in the streets. 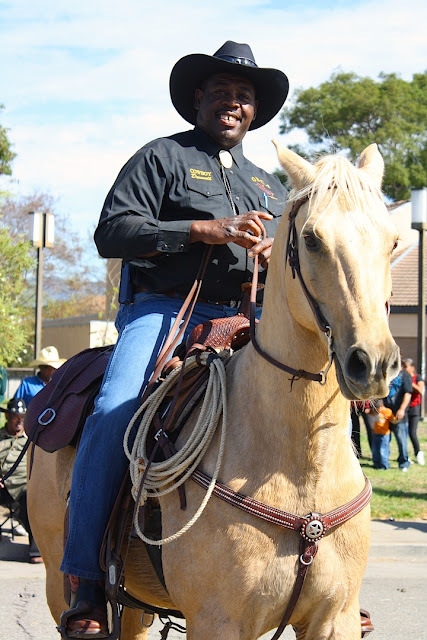 The OBCA educates the public, especially school children, about the history of black cowboys, estimated to have comprised 25% of the West's cowboys after the Civil War. The cowboys were particularly attentive to the kids in the crowd who were entranced by the horses. A barbeque and zydeco dancing capped off the event. Another piece of wall art in the courtyard of Sausage. It's by GATS (Graffiti Against the System) who is a prolific street artist in the area. His distinctive style can be found on many walls around town. See? Interestingly, the nose on each face looks like it's decorated in exotic script or maybe tattoos but actually lists the names of street artists he respects. Another bit of fun at Lake Merritt. Here is the entrance to the Eastside Cultural Center in the San Antonio district of East Oakland. 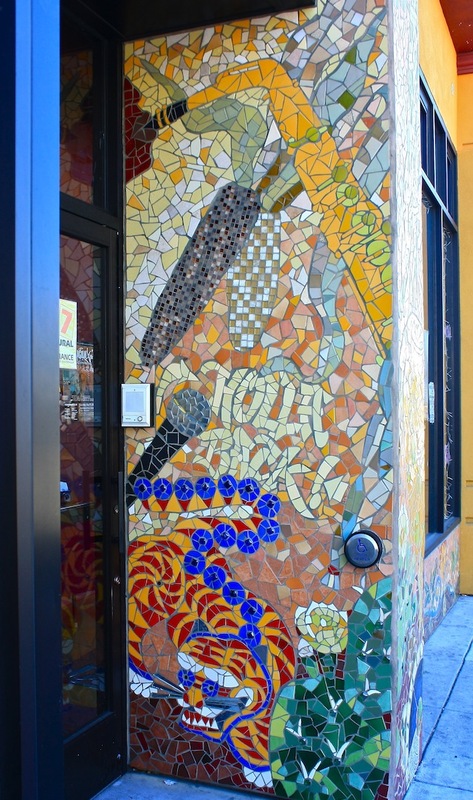 The mosaic mural is wonderfully composed with a tiger, maize, and saxophone, symbolizing the major groups that live in the neighborhood. Holla Back refers to the intercom visitors use to gain entry to the building. The message is further emphasized by the microphone next to the intercom. Other murals sponsored by the organization have been previously posted. If you like murals or have a mural you'd like to post, this meme's for you. Just follow the Linky steps below. You decide what constitutes a mural. Be sure to link back to this blog and visit your fellow posters. Looking forward to the mural finds posted this week. I will be out of town during September and my ability to comment may be limited. The Linky, however, will continue to go up 8 PM PST each Sunday.